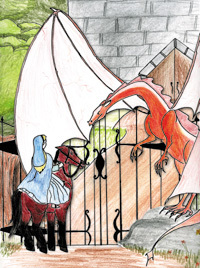 "A delightful book from a talented young writer is what you’ll find in Martha & Chip by Katharine Sohler....What a fabulous and fun fantasy adventure for young readers ages 9 through 12. Not liking how rats were portrayed on TV and in the movies, young Sohler set out to write a story where one of the heroines would be a rat. Martha meets Chip (the rat) while trying to defeat Aylis and save the White Magi. Together, they can do amazing things, which shows young readers the importance of friendship, cooperation, and working together for the greater good....While the main characters are girls, there are enough dragons around to entertain the boys in your house....Sohler also illustrated the book, so I tip my hat to her. 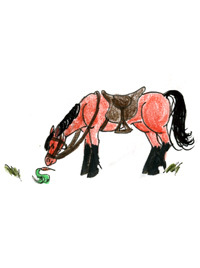 Katharine Sohler is definitely a young writer and artist to keep your eye on!" "Martha and Chip is the hilarious “tail” of a fun-loving rat and an evil witch....I loved this book because it was so funny. A good example of this humor is the introduction. Most books I read have a long and boring foreword saying, “I’d like to thank blah, blah, and blah for . . . .” But not this one. Instead it has an introduction about weeping dinosaurs. 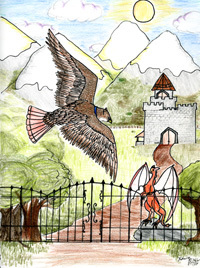 The body of the book is pure fun and fantasy, with dragons, talking rats, and manticores." Practically no knights reside in the kingdom of Crabbapple. And those who do are almost completely useless. This is because the kingdom has been at peace for a long time. But trouble still arises now and then in Crabbapple, and whenever it does, it is up to a troop of intrepid guardians, the White Magi, to take care of things. Martha is one White Mage who thinks it may be a little too quiet in Crabbapple lately. Aside from chasing rats out of her garden, she hasn't had much to do. Her fears are confirmed when her fellow Mage, Mabel, appears one day with terrible news: the witch Aylis has been capturing the White Magi one-by-one. And now they are the only two left! Now, Martha may not like rats, but she isn't afraid of any old witch. Unfortunately, Aylis isn't any old witch. She's got dragons, and lots of them—from small green ground dragons to huge red fire-breathing monsters. Martha will need help to get past them and save the other White Magi. But sometimes the greatest help comes in the smallest packages. Suitable for young readers, age 9 through 12, Martha and Chip is a fun-filled adventure that shows that even the most humble creatures among us have important gifts to give. Katharine Sohler is a 19-year-old homeschooling graduate from New Jersey. She is a great lover of nature, science and storytelling. Katharine is currently a student at John Paul the Great Catholic University. with a 10% discount using a credit card, click the button below. Below are a few samples of the original illustrations from Martha & Chip, rendered in grayscale in the book.